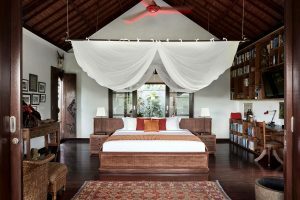 This is the largest bedroom, tile thatched, styled and named after the the pictoresque Bali Aga village near the east Bali coast. Standing on columns, overlooking the main pool, it is right on the brink of the lower garden area. The breezy high perched veranda offers a close view over the rice paddies to the mountain in the distance. This house has a large queensize bed and a spacious walk-in closet. It is possible to supply with an extra bed if needed. The parltly open bathroom, floored with natural stone tiles, offers two washbasins, WC and shower cabin. Directly connected is a beautiful open, walled spa-area, covered by a traditional bale in the middle of a reflecting Koi-pond. 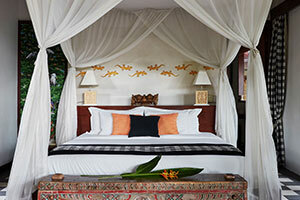 This house is styled and named after the old royal town in the center of east Bali. 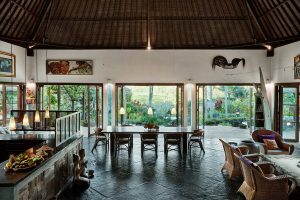 It is located closest to the main house, and it has the loveliest view to the ricefields from the relaxing bale right in the center of a small private water garden. The bedroom has a hardwood floor and is fitted with a queen size bed (with dividable mattresses if needed), a walk in closet and a TV with DVD-player. This house is styled and named after the nearby town – Bali’s cultural center. The bedroom has a tile floor and is fitted with a queen size bed (with dividable mattresses if needed), and a TV with DVD-player. The bathroom, floored with natural stone tiles, offers two washbasins, WC and shower cabin. In addition, it has a small walled garden with an open air shower. 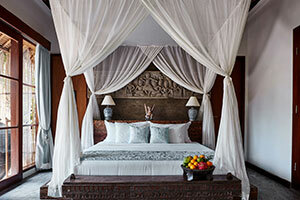 This house is styled and named after the former capital and trading town on Bali’s north coast. The bedroom has a tile floor and is fitted with a queen size bed (with dividabe mattresses if needed), and a TV with DVD-player. It is possible to supply with an extra bed if needed. The bathroom, floored with turquise coloured terazzo, offers two washbasins, WC and shower cabin, as well as a small walled garden with an open air shower. 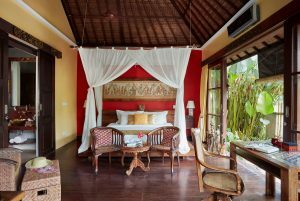 The Ubud- and the Singaraja Houses share a private open air fully equipped kitchen- and dining-bale, as well as a private spring-water fed plunge pool and pool-deck. This house offers a large living- and dining area as well as a fully equipped open kitchen, fitted with side-by-side fridge, oven and microwave oven. The living- and dining area has a natural stone floor and a spectacular cathedral-like traditional ceiling. It is furnished with spacious sitting areas, a 10 seat dining table and multiple artwork. The rooms open through folding doors towards a spacious natural stone floored veranda, all surrounded by water lily-covered, terrassed fishponds and with two flanking traditional bales offering breezy, shady relaxation. The airconditioned mediaroom/library has a hardwood floor, is fitted with comfortable rattan relaxing chairs and coffeetable and offers the best of audio and video equipment. A tastefully decorated guest powderroom is also located in the main house.